Have you ever looked down at your bathroom sink and seen its porcelain whiteness marred by your beautiful locks of hair and wondered what happened? There’s a condition doctors won’t tell their patients about. It sneaks up on an unsuspecting person. When you tentatively voice your worry about it, doctors dismiss you because what’s hair loss compared to concussion, eh? Relatives tease you or pretend it’s not happening. 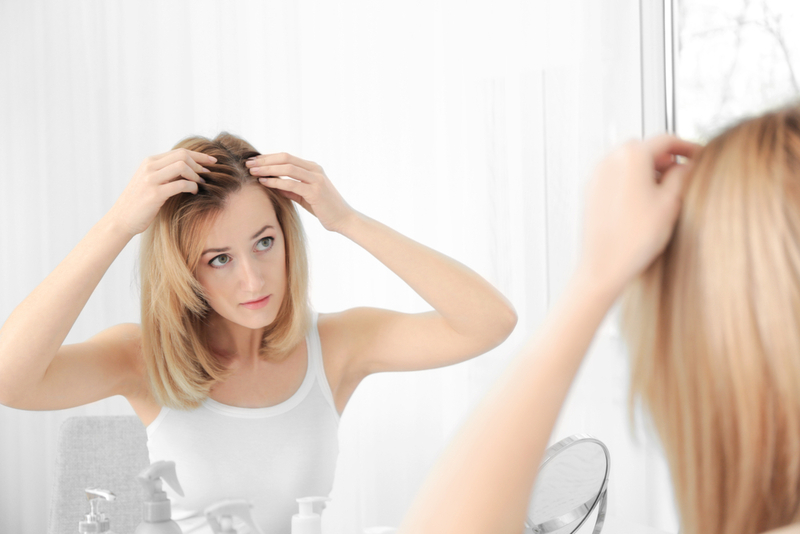 Neither reaction makes you feel better as day after day, your hair silently leaves your scalp. You find strands and strands of hair on your pillow, in your sink, on the floor. Your brush waits for that first stroke to fill its bristles up with hair. And no one gives a damn enough about your distress to tell you why. In short, massive hair drop or the big sink clog or the human hair pillow. Yes, folks, your crowning glory falls out because of the stress from suffering an illness or injury such as concussion and no one cares but you. And your hairdresser. Judy Taylor found this out herself. Judy was the woman who was the first person in the world to live without eating, thriving on artificial feeding for twenty years, and the subject of my first book Lifeliner. She suffered massive hair changes as a result of what she went through. Now, you’d think that with catheters and relying on Total Parenteral Nutrition (TPN) for her life, she couldn’t care less about hair changes or hair loss. But you’d be wrong. Hair is important. Balding men go through painful hair plugs to reverse the fall out; men and women dye their hair to cover up the dreaded colour change; women buy wigs to hide balding from chemotherapy; men impose hair codes on women (and women take on those codes as their own); artists even created a rock opera called Hair. Hair is powerful. Hair is beauty. Hair reflects our personality. So when it falls out in great handfuls in the shower or greets us in the morning all over our pyjamas instead of staying on our head where it should be, it’s a bit disturbing. Judy tried to talk to her physician Jeej about it, but he was concerned with her bigger problems. She eventually did get some help, which you’ll have to read my book to find out about, but I remember thinking when I heard this story that it must be very hard to first lose the hair you’re used to and then having to persist to get some attention on remedying it. I didn’t think I’d undergo something similar. I didn’t understand why my hair suddenly began to grey and, worse, fall out in sink-covering clumps after my brain injury. I consoled myself that I was born with such vast amounts of hair that though I lost half of it and the heightened shedding continued year after year, I wasn’t obviously bald. When my hair would start to thicken up again, I’d hold my breath, hoping this was not some horrible tease by the universe. Unfortunately, it was. I didn’t understand why when my hair began to stay and I began to relax, I’d brush my hair one morning and find it filled with strands. The incomprehension added to my despair. Mental health is important to brain-injury recovery and the reduction of the perception of stress. The despair I felt was like a brake on my recovery. Yet no health care professional seemed to understand that. And so, for this problem like for so many of my other concussion-caused problems, I had to find an answer on my own. Years later when I became well enough to search for an answer to help myself and learnt about telogen effluvium, that knowledge helped me cope. Whenever I began to lose my hair again, I’d take deep breaths and count back the months. Inevitably, I’d realize that three months earlier, I’d experienced a more-than-usual stressful event. Insurance mediations that were a sham. Or pre-trial negotiations that dragged on. Or doctors dismissing the very unpleasant sequelae of brain injury during an appointment that I’d waited months to get. Or the sudden loss of health care. Or the ending of one more friendship due to brain injury. That’s the problem with brain injury: there’s the initial trauma that induces telogen effluvium; then there’s the continuing severe relationship traumas and stressful events that arise out of it, each one coming on the heels of the previous one like a never-ending train. When brain injury is left untreated, when concussion is dismissed as go home and rest, your hair becomes one more casualty. Your hair loss very obviously reflects the medical neglect of this life-altering injury.